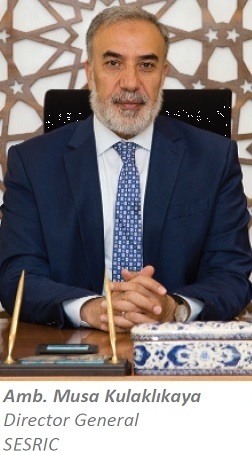 Since its establishment on 1st June 1978, The Statistical, Economic and Social Research and Training Centre for Islamic Countries (SESRIC) have contributed to the wellbeing of the Muslim Ummah within its three mandated areas; namely statistics, socio-economic research and training and technical cooperation. It was established as a subsidiary organ of the Organisation of Islamic Cooperation (OIC) and serves to 57 member countries of the OIC, which are spread across four continents. In its 40th Anniversary, the Centre continues to enhance its role in bolstering the efforts of the OIC and its member countries towards enhancing cooperation, unity and solidarity and ensuring sustainable development, progress and prosperity of the Ummah. SESRIC tries to align its programmes and activities with the main goals and objectives of the OIC Programme of Action “OIC-2025” and the Sustainable Development Goals (SDGs) of the Post-2015 Global Development Agenda and individual needs and priorities of the member countries. In this regard, the Centre has initiated and implemented a wide range of technical cooperation programs, projects and activities, through different modalities, including exchange of experts, training workshops, study visits and networking in close cooperation and collaboration with a wide range of relevant OIC, national, regional and international institutions in various areas and fields of immediate interest to the OIC countries. Furthermore, the Centre also facilitates to strengthen technical cooperation among member states through networking activities. In this regard, SESRIC has established networks such as “Reproductive, Maternal, Newborn and Child Health Network”. SESRIC has also initiated, in collaboration with its stakeholders, various common platforms, such as the OIC Health Portal, to facilitate the sharing of knowledge between OIC Member Countries. In the domain of research, SESRIC has over the years accumulated long and rich research experience in various socio-economic development issues and challenges of the OIC member countries. The Centre regularly studies and evaluates the economic and social developments with a view to generating proposals for enhancing cooperation among OIC countries. In this way, the Centre contributes significantly to the OIC policy dialogue mechanism through analyzing the current situation at the OIC level and suggesting the appropriate policy actions that need to be taken in order to face the challenges and strengthen the intra-Islamic cooperation in the concerned areas. The Centre contributes to prepare some OIC strategic plans and programmes of action documents in various socio-economic fields and areas, such as health, youth, labor market etc. Furthermore, through hosting and managing the most comprehensive statistical database on the 57 OIC member countries, our Centre collects and disseminates the necessary statistical data and information on these countries that would make them better informed of each other’s potentials and needs and, thus, facilitate their elaboration of cooperation projects and integration schemes. SESRIC also plays an important role in strengthening and improving the national statistical systems in the member countries with a view to producing better national statistics and thus helping policy-makers by introducing better national policies and strategies. On the occasion of SESIRC’s 40th Anniversary, my thanks and profound appreciations and gratitude goes to the governments of OIC member countries, OIC Institutions, International, Regional and National Organizations and other relevant stakeholders for their openness and readiness to cooperate with us. Also, a special thank goes to all SESRIC staff, previous and current, for their tremendous role and the immense efforts. In the end, I would like to express our readiness at SESRIC to strengthen our cooperation and partnership with all relevant stakeholders in our future work in order to contribute to the wellbeing and prosperity of the Muslim Ummah.